BAE Systems has been awarded a contract to supply MK38 Mod 2 machine gun systems to the US Navy and Philippines Government. Under the $24.2m firm-fixed-price contract, the company will deliver 21 MK38 Mod 2 machine gun systems and associated spare parts according to the US foreign military sales programme. The contract award combines purchases of systems by the US Navy, which make up 92.7%, with Philippines receiving 7.3%. BAE will supply spare parts such as 13 Toplight assemblies, 12 multi-function displays, four main control panels, six battery chargers, as well as one installation and checkout spare. 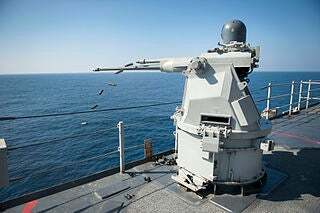 Integrated with an eye-safe laser range finder, the MK 38 Mod 2 machine gun system ordnance alteration (ORDALT) kit features on-mount day/night electro-optical suite and two-axis stabilisation, with remote control capabilities for engaging multiple surface threats in all sea environments. "Integrated with an eye-safe laser range finder, the MK 38 Mod 2 machine gun system ordnance alteration kit features on-mount day/night electro-optical suite and two-axis stabilisation." Additional features of the system include Toplite electro-optical fire control system to enhance its capability to engage in enemy targets during day and night, as well as all weather conditions. Designed to support ship self-protection mission, the MK38 Mod 2 minor calibre gun’s main weapon is the M242 Bushmaster 25mm chain device, which has a 2.5km range. Capable of providing 4-axis gimbal stabilisation, the Toplite system consists of forward looking infra-red radar with three fields-of-view, a low-contrast, low-light level colour television camera and an eye-safe laser range finder. Deliveries are scheduled to start in November 2013. Work is expected to be complete by May 2014 and the contract will be conducted in Hafia in Israel, and Louisville, Kentucky, US. The Naval Surface Warfare Center, Maryland, US, will serve as the sourcing customer administering the contract. Image: An MK38 MOD 2 25mm machine gun system aboard USS Pearl Harbor. Photo: US Navy photo by mass communication specialist 2nd class Jason Behnke.